Who wants to be a bee? I don’t claim to know the deepest desires of insects that visit our gardens and farms, except that they want to survive, eat and reproduce. So why do so many mimic other insects that are dangerous, such as yellowjackets? The black and yellow stripes of a typical yellowjacket are easily recognizable to birds, humans and other mammals and signal “Danger! I sting!”. That’s a pretty powerful message that ensures yellowjackets and other wasps and bees are avoided by hungry predators looking to raid the colony for tasty larvae or honey. It’s called aposematic coloration and serves as a warning to other animals not to mess around. From skunks to poison arrow frogs to snakes, aposematic coloration protects both predator and prey from unfortunate interactions. Hover fly on daisy fleabane. matter) and some are predatory on smaller insects, like aphids and thrips. Aphids, alone, cause tens of millions of dollars in crop damage each year. 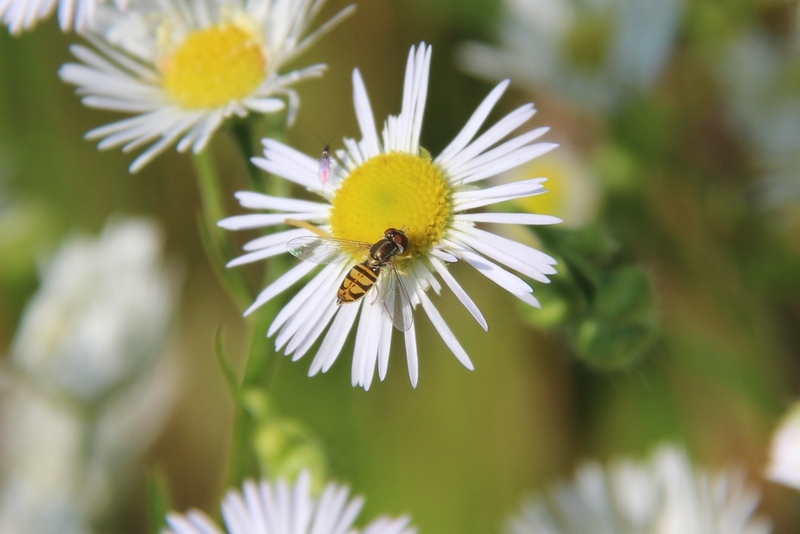 Hover flies are considered among the many important natural enemies of aphids and other plant-feeding pests. A gardener’s friend, indeed! and enjoys the protection that such mimicry provides. How could you tell it apart from a bumble bee? All flies, including these, have only one pair of wings. Look closely at the image and you can see a round dot at the base of the wing. That is called a haltere, which is a wing reduced into a flight stabilizer. You can also see very enlarged eyes, relative to the head, small V-shaped antennae and a thick straw-like mouth. Yes, robber flies can bite! But they are voracious predators of other insects – whatever they can catch. 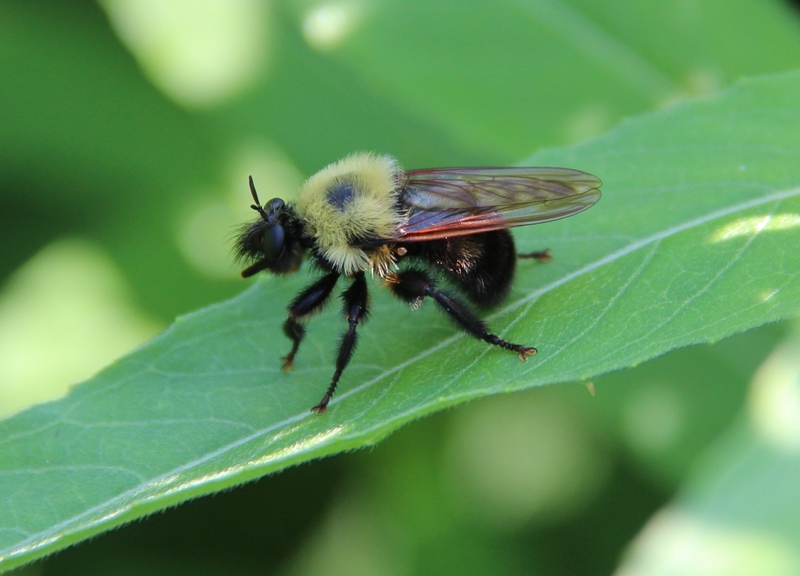 Although robber flies are indiscriminate about what other insects they eat, if you have a garden with pests and you see robber flies, they are probably doing good deeds for you. By looking closely at the many insects that visit your yard and garden, you might be surprised at how many beneficial insects you see. Maintaining your green space using fewer pesticides and incorporating IPM strategies to manage plant feeders will help protect these amazing natural enemies. This wasp helps control pests while doing adjunct duty as a pollinator. Photo courtesy Ward Upham, Kansas State University, Bugwood.org. 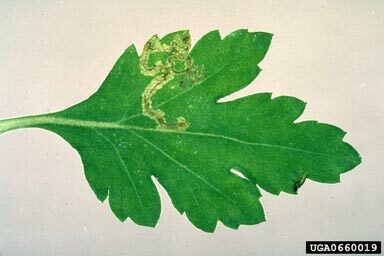 This chrysanthemum leaf-miner is the larvae of a fly-family pest. Photo courtesy Central Science Laboratory, Harpenden Archive, Bugwood.org. 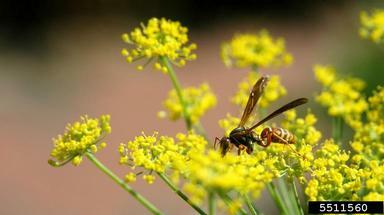 Some large stinging wasps eat crop pests; others help pollinate them. Some do both. “For an aphid, a raindrop is something like what a refrigerator would be like falling on us,” said researcher Jeremy McNeil, an entomologist and chemical ecologist at the University of Western Ontario in Canada. Fleas can live a long time inside the cocoon they pupated in — until they sense a host nearby. Follow the link to a fun, one-minute video of a fat mouse scrambling through a tiny hole. Their name (they dig mines, as it were) gives them away — but you’d be surprised at how many different sorts of insects have larvae that burrow through something as thin as a leaf.